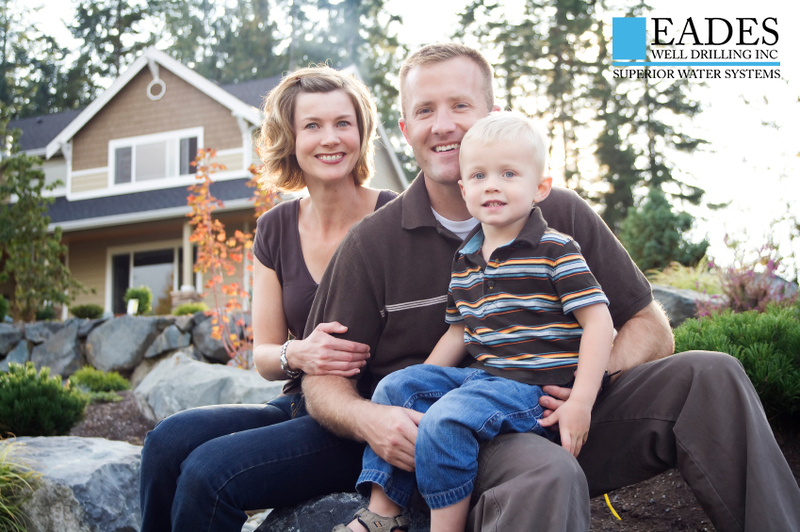 Residential Well Water Systems & Water Pumps - EADES WELL DRILLING INC.
Water is the liq­uid of life, pure and sim­ple. EADES WELL DRILLING is lit­er­al­ly in the dirt now for Four Decades, find­ing cool, sweet water for your home, farm and busi­ness needs with our Pure­Flow™ Sys­tems. The excite­ment of a new home is a thrilling expe­ri­ence. In the plan­ning phase, floor plan, heat­ing and cen­tral air con­di­tion­ing, rooms, en suite, bath­rooms, fix­tures, win­dows, doors, floor­ing, stair­cas­es, exte­ri­or sid­ing or brick, land­scap­ing, in-ground sprin­kler sys­tems, décor and colour motif, fill the plan­ning hours. The elec­tri­cal ser­vice is decid­ed upon and the plumber is doing his thing. Wait ! Some­thing is miss­ing ! What about the water ? Where is it going to come from ? Oh ! Yes ! The Well. It’s just a hole in the ground and then there will be water for all needs…right ? The well can go any­where cor­rect?… maybe there or over there ? What do you mean the Mort­gage Com­pa­ny or Bank may want to see water flow tests and water qual­i­ty results before the mort­gage is approved ? The prover­bial detail pin is about to burst the new home dream bub­ble. You mean to tell me my home is vir­tu­al­ly worth­less with­out a prop­er well ? Unfor­tu­nate­ly yes ! No water, no life, it’s as sim­ple as that. You meant to tell me, the water comes first ? Yes it does, with­out water, the rest does not mat­ter. What do you mean the rest doesn’t mat­ter … the house is going to be beau­ti­ful. Yes it will be beau­ti­ful, how­ev­er, with­out prop­er water sup­ply and pres­sure sys­tem, the qual­i­ty of mod­ern life with­in becomes a mis­ery. A well is not an end­less sup­ply from potable munic­i­pal sys­tems. You can’t sim­ply hook up the gar­den hose, drag it to the pool and fill it for a week. It doesn’t work that way. 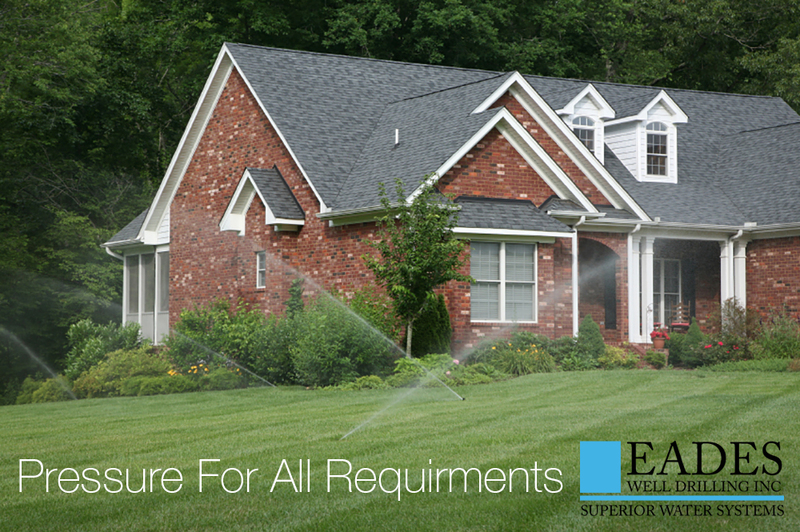 A well and prop­er deliv­ery sys­tem includ­ing pres­sure and arte­r­i­al sup­ply make for a hap­py home with all the house­hold water needs met and more. A well to give long ser­vice needs to be planned and looked after. What does all this mean ? It means with prop­er plan­ning, deliv­ery sys­tem, pres­sure tanks and prop­er plumb­ing a dish­wash­er com­ing on does not reduce the show­er to a trick­le nor does the kitchen sink cold water tap turn­ing on for a drink pro­duce scald­ing show­er results else­where. It’s a process of bal­ances. WELL + Water + Pump + Sus­tained Deliv­ery + Pres­sure Sys­tem + Arte­r­i­al Plumb­ing = Good Liv­ing. What’s In Your Well ? Did you know many old­er water wells in Ontario are not up to today’s M.O.E (Min­istry of Envi­ron­ment) stan­dards. These wells are at high risk for sur­face con­t­a­m­i­na­tion such as col­iforms, e-coli, and oth­er pol­lu­tants, affect­ing the health of every­thing that drinks from the well. Many of these wells are dug or cre­at­ed from old­er obso­lete meth­ods. Low Producing or Dry Well ? 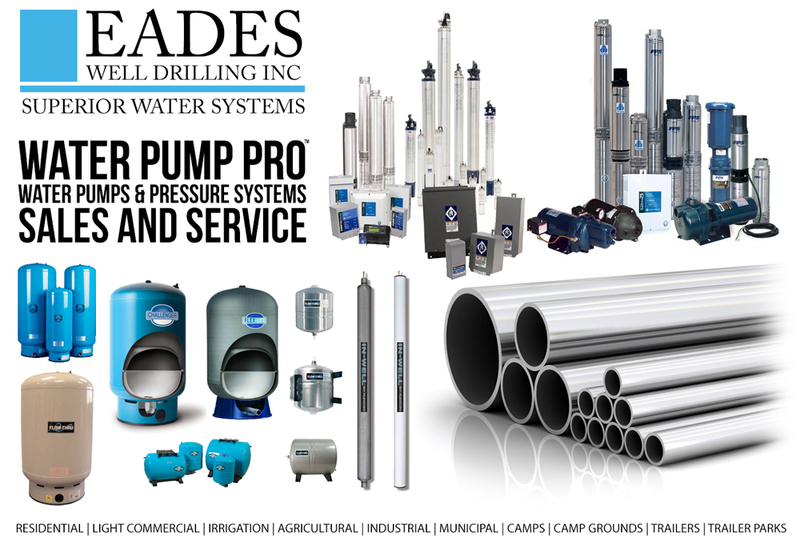 EADES WELL DRILLING, water well contractor of choice, provides expertise in increasing the flow rates of low-producing or hot-weather dry water wells. With excellent service results, and options for peace of mind, we are the company to call. Increased corrosion of the metal parts of the well and distribution system is also an indicator.